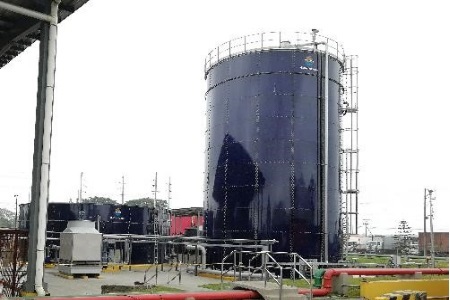 Global paper manufacturer and distributor PAPELERA NATIONAL S.A. (PANASA) is enhancing its sustainability with a new Global Water & Energy (GWE) wastewater treatment plant in Guayaquil, Ecuador. The organic contamination present in the PANASA’s wastewater stream will be converted to biogas by GWE’s ANUBIX – T Expanded Granular Sludge Bed (EGSB). “ANUBIX -T reactors are designed with a focus on minimal maintenance and operational requirements. Their tower-like design also saves a significant amount of space compared with other wastewater treatment plant designs,” says GWE, which has more than 400 high-efficiency wastewater treatment projects in 64 countries. GWE recently rebranded from Global Water Engineering to reflect a growing focus on green energy generation. GWE’s ANUBIX -T, including auxiliary equipment and tanks, was chosen after a thorough supplier selection process. GWE’s new waste-to-energy technologies will be incorporated into PANASA’s existing aerobic wastewater treatment facilities as a turn-key project. “Selection of the ANUBIX -T turn-key solution is a testament to the engineering ingenuity of the system, and the hard work of the entire GWE team in making sure all of PANASA’s needs were met,” says GWE. GWE’s ANUBIX -T can be used for the anaerobic treatment of wastewater streams in a broad range of applications, including breweries, soft drinks and other beverages production, paper mills, starch production, and many others. ANUBIX -T is an ultra-high loading-rate system utilizing expanded granular sludge bed technology. It is suitable for high-strength wastewaters with organic content up to 15,000 mg/l. GWE has ANUBIX -T installations in several countries globally, where the generated biogas is often used to power boilers, or sold back to the grid for a profit. The ANUBIX -T reactor is capable of handling very high loading rates of up to 25 kg COD/m³/d, depending on the type of wastewater. For more information, visit www.globalwe.com.